This blog will be used as the place for Dr. Bartlett's high school students to post and comment on Biblical thinking in science and math as applied to practical life and seen in God's awesome creation. Baraminology is a new field of biology and is the creation science alternative to classifying biological organisms with evolutionary thinking. It is not yet complete, but neither is the evolutionary three or five or other kingdom classification systems. God created by kinds that don't have common parents. He created plants, he created animals, he created people. He created horses, he created dogs, he created lizards, he created fish. Evolutionary based classification systems attempt to connect all kinds and species. 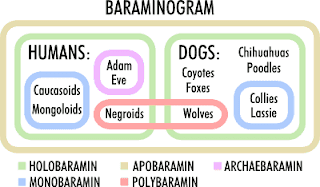 The Bible and the creationist work on the Baramin system of classification don't connect the kinds. Here is one drawing to get you thinking about Baraminology and some quotes on the key points. 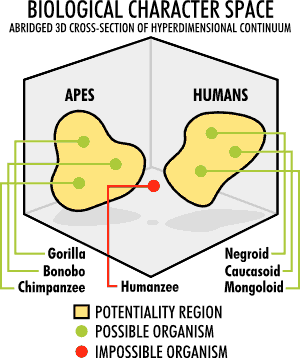 There is still plenty of room for further research into God's taxomony of biological life. "The Darwinian macroevolution model is represented by a single tree of relationships, every form of life being related to every other form of life (Figure 1). In the baraminic model there is a forest of trees without connecting roots (Figure 2). One of these rootless trees would have branches representing only human diversification, another for canids, another for felids, etc. For people reared on an evolutionary diet, the above menu can be difficult to swallow and digest, because students of biology have been taught to think genetic relationship rather than genetic discontinuity. " "It is like there has been a huge snowfall covering the trees to the top, and we are digging down into the snow to identify the connections, the branches, limbs, and trunk. Is there one tree below? Or is it an orchard of separate distinct trees? As the data slowly come into view we will have arguments about what is connected to what, or whether there is discontinuity at a given place." It sure would be nice for this to have already been figured out, before we study science and biology, but it seems that this process of man taking dominion by naming things in alignment with God's creating of things is still work that needs your generation to flush out the details of. Try sketching out a few kinds yourself to see how far you get. How far can you get starting with your favorite pet? Penguins? What problems do your notice with the five kingdom system: kingdom, phylum, class, order, family, genus, species? What problems do you see in discussing a new system of classifying biological life? How far does the Bible go in biological classification? Does body, soul, spirit all need to be part of baraminology characteristics? How would you differentiate a fly from a horse from a eukaryotic cell or person specifically and Biblically? Should You Obey Evil Instructions? The mathematical sciences, and particularly arithmetic, geometry, and mechanics, abound with advantages, and if there were nothing valuable in them for the uses of human life, yet the very speculative parts of this sort of learning are well worth our study; for by perpetual examples they teach us to conceive with clearness, to connect our ideas and propositions in a train of dependence, to reason with strength and demonstration, and to distinguish between truth and falsehood. Something of these sciences should be studied by every man who pretends to learning, and that not so much to make us mathematicians, as to make us reasonable creatures. Those who have a natural talent for calculation are generally quick at every other kind of knowledge; and even the dull if they have had an arithmetical training, although they may desire no other advantage from it, always become much quicker than they would otherwise have been. Arithmetic is a kind of knowledge in which the best natures should be trained, and which must not be given up.